Over the years data assimilation methods have been developed to obtain estimations of uncertain model parameters by taking into account a few observations of a model state. The most reliable Markov chain Monte Carlo (MCMC) methods are computationally expensive. Sequential ensemble methods such as ensemble Kalman filters and particle filters provide a favorable alternative. However, ensemble Kalman filter has an assumption of Gaussianity. Ensemble transform particle filter does not have this assumption and has proven to be highly beneficial for an initial condition estimation and a small number of parameter estimations in chaotic dynamical systems with non-Gaussian distributions. In this paper we employ ensemble transform particle filter (ETPF) and ensemble transform Kalman filter (ETKF) for parameter estimation in nonlinear problems with 1, 5, and 2500 uncertain parameters and compare them to importance sampling (IS). The large number of uncertain parameters is of particular interest for subsurface reservoir modeling as it allows us to parameterize permeability on the grid. We prove that the updated parameters obtained by ETPF lie within the range of an initial ensemble, which is not the case for ETKF. We examine the performance of ETPF and ETKF in a twin experiment setup, where observations of pressure are synthetically created based on the known values of parameters. For a small number of uncertain parameters (one and five) ETPF performs comparably to ETKF in terms of the mean estimation. For a large number of uncertain parameters (2500) ETKF is robust with respect to the initial ensemble, while ETPF is sensitive due to sampling error. Moreover, for the high-dimensional test problem ETPF gives an increase in the root mean square error after data assimilation is performed. This is resolved by applying distance-based localization, which however deteriorates a posterior estimation of the leading mode by largely increasing the variance due to a combination of less varying localized weights, not keeping the imposed bounds on the modes via the Karhunen-Loeve expansion, and the main variability explained by the leading mode. A possible remedy is instead of applying localization to use only leading modes that are well estimated by ETPF, which demands knowledge of which mode to truncate. 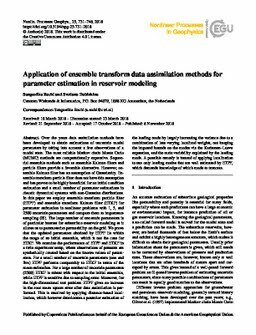 Data underlying the paper: Application of ensemble transform data assimilation methods for parameter estimation in reservoir modeling.